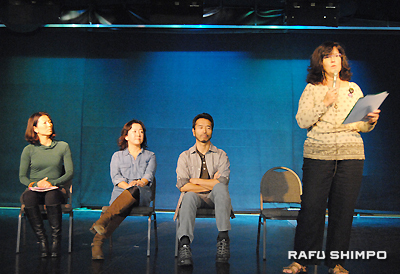 Voices from Fukushima draw strong responses at L.A. screening. From anti-nuclear activists to concerned citizens, approximately 70 people, young and old, gathered at Alvas showroom in San Pedro on Nov. 2 to watch “A2-B-C,” an award-winning documentary directed by American filmmaker Ian Thomas Ash. Dance 4 Oceans, an environmental volunteer group that raises public awareness about trash pollution in the ocean, hosted the event. Although people prefer to view the 2011 Fukushima disaster as a thing of the past, “it’s still going and getting even worse,” she said. • Post-tsunami deaths due to stress and other health complications now exceed 1,607 — the number of people who were killed in the initial calamity in Fukushima. She emphasized the importance of continuous efforts to raise awareness about the aftermath of the Fukushima disaster as well as the danger of nuclear power plants. Stella Cruz of Carson, who previously had limited knowledge about the disaster, said, “It’s devastating. It’s very sad and disappointing. It’s so unbelievable to me that the government is allowing this to continue.” She saw her children and herself in the film, and wiped tears from her face. Dave Rubin of Los Angeles was viewing the film for the first time, too, but he has always had great concerns about the danger of nuclear power plants. 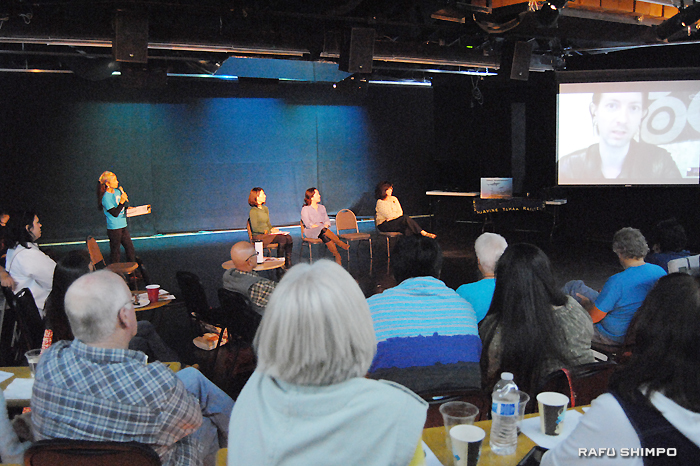 After the screening, a panel discussion was held with Ash (who participated via Skype from Japan) and four local panelists: Beverly Findlay-Kaneko and Yuji Kaneko from Families for Safe Energy, Yoko Collin, a concerned citizen and a mother of two, and Miki Bay, an anti-nuclear activist. Beverly and Yuji Kaneko, who recently visited Fukushima, said that the situation has changed since the filming: no radiation detectors on children’s backpacks, no children wearing masks, no radiation warning signs. Local markets were even full of fresh fish from the Tohoku area. Despite the fact that radiation from the Fukushima Daiichi nuclear power plant is still leaking into the ocean and many countries continue to ban imports of certain food products from Fukushima, the school lunch program — funded by the Japanese government — promotes Tohoku-grown products in Fukushima. According to Beverly’s measurement near a school, radiation detected in Fukushima was nine times higher at waist level and 11 times higher at ground level than in Yokohama. “The mothers’ worries about their children’s future are unchanged,” she said. Ash added that parents who voice their concerns about their children’s safety and the danger of the nuclear power plant in Fukushima often become targets of bullying by other local people who are afraid of spreading harmful rumors, which they claim would damage local businesses. Because of this trend, the mothers who appeared in the documentary have insisted that the film not be released online or on DVD. Ash said he only has their permission to show it at private screenings. The film has been shown at 24 film festivals and has received positive responses from viewers. However, Ash pointed out that most of the audience members who attended those screenings are already interested in environmental or nuclear issues, and that capturing the attention of the general public is his current challenge. For more info about Ash’s film, visit www.a2documentary.com. Dance 4 Oceans hosts film screenings, lectures, and beach cleanings to raise awareness about pollution in the ocean. For more information, visit www.dance4oceans.wordpress.com or call (310) 947-4999.